The project aims at putting in place a mechanism and know-how for the replacement of lost forest in the Mount Cameroon Region. Through the project, alternatives source of wood for general household heating and cooking will be put in place which will reduce the pressure that is presently mounted on our forest by community’s high demand for wood. At the same time community members and students are being educated on the importance of forest and what they can do to preserve it. They are also given skills through training that can help them run economic activities through the production of seedlings of important economic tress of the region. Through the project, tree nurseries have been established in 3 communities of the Mount Cameroon Forest Region. These nurseries also serve as training ground for community members who are currently receiving hands on training on Tree Propagation and Nursery Management. This practical phase comes after a capacity building workshop which was organized early this year at the Fakoship Plaza Conference Hall with resource persons coming from the Cameroonian Institute for Agronomic Research (IRAD). The project targets the production of more than 6000 trees for planting in the Mount Cameroon Forest Region and beyond. It is also expected that these nurseries will continue to serve as a constant source of tree seeds and seedling to their surrounding communities. Tree species propagated include medicinal, ornamental, fruit and those suitable for the protection of water catchments. Arrangements are currently ongoing with beneficiary communities towards the planting of these trees in the various villages. Green Cameroon wishes to thank Eco-Peace Leadership Center, Yuhan-Kimberly University who funded this project and all its supporters for their unfailing support and encouragement so far. We promise to bring you constant updates on the projects as the days go by. Join Green Cameroon and be part of The Change You Need!!! Read more about the Green Media Campaign. In Cameroon, we have observed a general lukewarmness when it comes to environmental issues and people seem to pay very little attention to conservation and the sustainable use of natural resources. One of the reasons for this behaviour is due to ignorance and lack of a proper sensitization mechanism. Another reason is also due to the fact that there is a vacuum in our educational system due to the lack of environmental education as a subject in the secondary and high schools curricula. 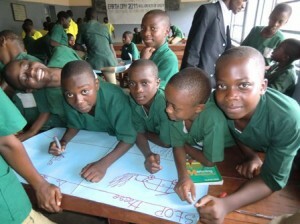 Read more about the Green Schools. Through this program, we practically work on identifying and redressing top priority problems in some vulnerable communities. Through studies, projects are identified, solutions are proposed and projects are designed to solve the identified problems. 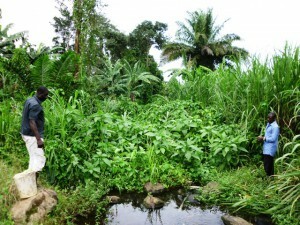 Currently, under this environment project, Green Cameroon has worked with the communities of Likoko, Naanga, Bokoko and Bonduma. In these communities, the main problem is lack of potable water. A project proposal has been developed already to provide Bokoko and Bonduma with potable water and fundraising is currently going on for onward implementation. Afterwards we will extend this project to many other communities as there can never be any true sustainable development without socie-economic development. This is a United Nations Regional Centre of Expertise on Education For Sustainable Development. 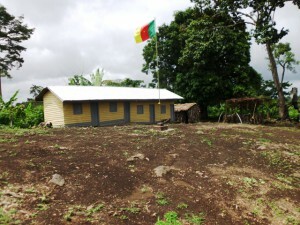 Green Cameroon headed the creation of this centre in Cameroon which was recently acknowledged by the United Nations University of Advanced Study in 2012. Green Cameroon’s director is also the current director of this centre. 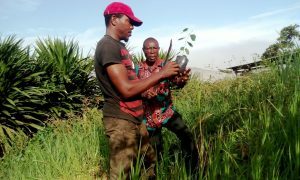 In our quest to fight global environmental problems such as climate change, deforestation and desertification, the community trees campaign program was introduced to cultivate the culture of tree planting in communities of the Mount Cameroon Forest Region. The project is about practically sensitizing on the importance of trees and forest and how they can best be managed in a sustainable manner. Through the project, we build tree nurseries in communities where we give the hands on training in the propagation of tree species, nursery management, tree planting and forest management. We also try to show community members the advantages in using modern agroforestry techniques and how they can solve some economic and farming issues common in the region. Green Cameroon has planted thousands of trees in this region under this project and has seen the development of many community nurseries. Under this project also come our climate change campaigns through which since 2006, during the UN Climate Change talks, we usually organize events like talks, conferences and demonstration to sensitize and advocate for better climate change resolution policies. Hope from the farm is a project that aims at using agriculture as a means of fighting the high level of youth unemployment, high crime rates, high dependency ratio and rural exodus that is taking place in communities of the Mount Cameroon Forest Region. The project encourages youths to get involved in agricultural activities and shows them that farming can be a major source of income if practiced and embraced in a serious and systematic way. Through the project, Some 100 youths from ten village communities of the Mount Cameroon forest region have been supported in setting up farms of some highly demanded local economic crops such as Plantains, Cassava and Yams. Support through this project came in forms of training, seed and equipment. Youths who are willing to embrace agriculture as their main source of livelihood were identified, recruited trained on economic and sustainable farming methods and upon completion of the training, they were expected to allocate a piece of land not less than one hectare where they are presently cultivating crops of their choice in large scale. Considering the high demand for these crops it is a known fact that a hectare plantation of any of them would be enough to provide for the immediate family needs of these youths with prospects of savings and expansion. The first group of beneficiaries benefited from this project since March 2014 and are now happily running their farms. 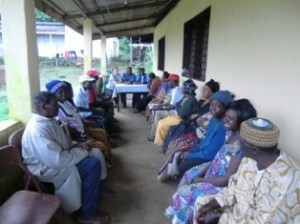 Green Cameroon’s team visits the farms regularly to find out how the crops and the youths are doing. Advice is given when needed and our encouragement is constant. A Second phase of this project is on the way and will see more beneficiaries from the Mount Cameroon Forest Region benefiting. This second phase comes in as a result of the huge success of the project recorded in the field with the first set of beneficiaries. Youths of villages that fall within the Mount Cameroon Forest Region are called upon and advised to indicate interest should they want to be included in the project scheme. The project can not reach all youths in one go, but Green Cameroon is putting in place plans to ensure that more and more youths from this region get the chance to benefit and by so doing, impact the lives of community members of this region. Please see more about the project on our blog. You can also see first hand testimony videos from community members and beneficiaries on our Face Book page. 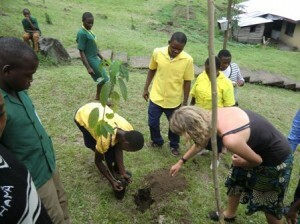 Local communities will plant and nourish trees in the Mount Cameroon Forest Region. They get the responsibility that the forest will stay in good condition. Worldwide, schools and individuals can ‘adopt’ a tree. 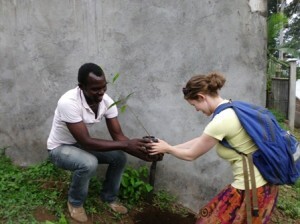 By adopting a tree the contributor enables the communities to plant a tree and manage the forest in a sustainable way. Green Cameroon on Thursday the 22 of May 2014 Lunched a Community Pig Farm Project in the Vasingli Village Community of Buea. 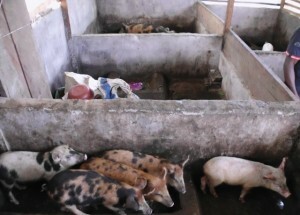 The Pig Farm Project will benefit unemployed youths, widows, orphans and single mothers of the Mount Cameroon Forest Region through the supply of start-up breeds for pig farming including training and follow-up. With funding from the Australian government, a community pig farm was established in the Vasingli village community where the piglets will be produced for distribution to the beneficiaries. Destribution will be coordinated by a Project Management Committee, made up of indegens of the beneficiary community. 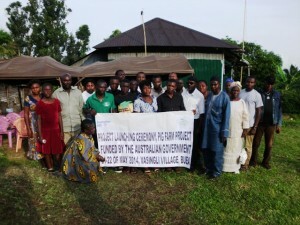 This project involves the introduction of a conservation friendly livelihoods support system in the Vasingli Community. Through it, capacities of community members will be built on some alternative income generating activities aimed at improving their living standards, curbing youth unemployment, illegal hunting and malnutrition. The project involves two main dimensions which are the capacity building and the economic empowerment dimensions. While the capacity building dimension involves equipping community members with all the skills and knowledge needed to run a pig farm, the economic empowerment dimension will ensure that they are provided with the necessary start up resources for carrying out these activities at individual level. – Curb poverty and youth unemployment in the vasingli community through the introduction of sustainable alternative income generating activities. – Fight against malnutrition by providing sustainable and affordable alternative sources of protein to families in these communities like chicken and pork. – Furnish community members with the skills needed to keep small scale farms and ease their access to start up resources through the provision of training and startup breed subsidies. – Get communities involved in the conservation and management of natural resources in the Mount Cameroon Forest Region through education and sensitization. Representatives of the community thanked Green Cameroon and the Australian government for what they termed a life-changing project as the Community Pig Farm. They also promised to make the best of the farm and ensure that the development which is sought is achieved through hard work and devotion. The project ended with heavy feasting and interviews from press men. The purpose of this initiative is to develop a Geographic Information System to assist the management of our environmental projects. As softwares are freely available, we aim at building a GIS without expensive inputs that could help us to target more accurately our actions in the future (e.g. tree planting initiatives). We also intend to share our gained experience with partners from the civil society that have usage of GIS for their own work. GIS presents a major advantage for us: they do not require important manpower and a reduced team can overview large areas from the office which is also cost-saving. 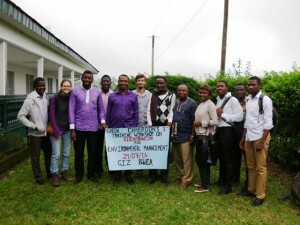 In partnership with the University of Buea, some students (both under graduate and post graduates), members of the Civil Society and youths from the community received training in GIS for environmental management. The first training/workshop took place at the conference hall of the GIZ in Buea followed by other sessions at the University of Buea, Green Cameroon’s office and in communities. Feedback from participants indicates that the training was really beneficial to them as it is a field of studies that is very necessary but not common around here when it comes to practically applying it to conservation and urban management. So far, Green Cameroon has set up a GIS database that is functional that will enable environmental management to take place where and when needed. Data collection process is still ongoing while another expert is awaited to continue with the training of students, community members and Civil society members. Any experts who are interest to volunteer on this project are welcomed to indicate their interest through our volunteer page. 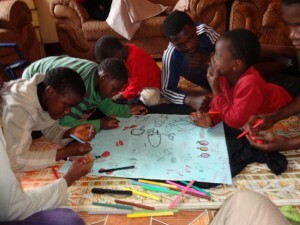 The Green Orphanages project originates from the Green Schools project. The idea is the same – to create an opportunity for the children to learn more about their environment in a more relaxed and informal atmosphere, than one might be used to in school classes. aware of their surroundings and how we affect it. Because the children in the orphanages are of different ages, almost all ages are addressed by using a vast range of teaching methods. everyone and it makes learning easier and more engaging as well. The goal is not to only supply information and knowledge on how things are, but also show children the causes and effects of different environmental aspects and how they can make a difference and an impact on environmental issues. In the first phase of this project, volunteers from Green Cameroon visit different orphanages for three months and conduct the activities themselves. In the same time, based on the experience gathered in those orphanages, a guidebook for independent use by the orphanages is in the making to ensure the sustainability and expansion of this project in these and other orphanages. So, ideally, in the second phase of this project, other orphanages in this region, that are interested, can use those guidebooks independently.